Six years ago today my dear friend Beth died. Every year since, I have approached this day with a sense of dread, the last week of her life in the forefront of my mind and a huge weight on my chest. The day itself is usually not as bad as the lead-up. I usually do something in honor of Beth, a little ritual or a special activity. This year, though, I thought little about the date or what it marked until today. Maybe it’s because the time that has passed – 6 years, almost my daughter Helen’s entire life. Maybe it’s just other thoughts crowding my brain this week, a deadline for a writing workshop, a summer camp snafu for Caleb, an upcoming family vacation. For whatever reason, I barely thought about it until this morning, while I was out on a bike ride. I have my first triathlon in over 2 years coming up in a couple of months, and this marked my first training ride in that long. (For the record, training rides for me mean that I ride a little harder and/or longer than I normally would, and reward myself with lunch after). I was smiling for most of the ride, when I thought about Beth, when I thought about my upcoming race. I thought about how I’m still not that fast on the bike and probably never will be, but look how far I’ve come since my surgery recovery when I was barely able to walk to the end of the block and back. The sun was out and I could see glimpses of Mount Baker on my way up the Boulevard and Mount Rainier on my way back. 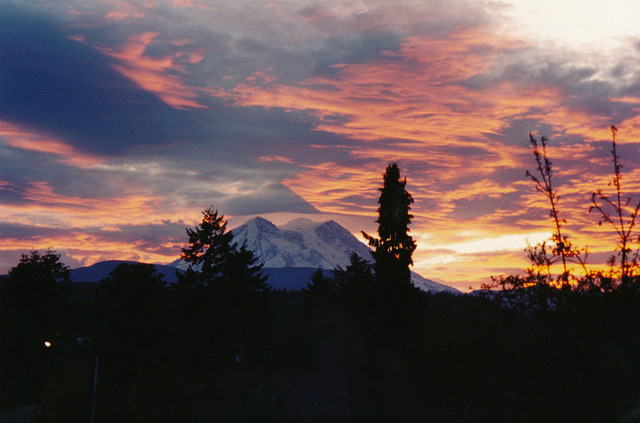 Beth’s ashes were scattered at Rainier, and she was in my thoughts especially much as I gazed at The Mountain. Now it’s overcast and some melancholy has set in as I sit at a café. If Beth would tolerate any memorializing of her today, she would insist that we steer our thoughts away from her last moments, and instead share happy stories. Here is mine. I miss you, Beth. On my 26th birthday, I received a card from Beth. Though she wasn’t a material person, she was fond of gift-giving, usually a small decorative item she bought from a local artist or fair-trade store. She wrapped her gifts in plain brown paper and made her cards by hand. This card, two years into our friendship, was a note written on the back side of a form letter she fished out of the recycling bin at work. A run-on sentence written diagonally in her loopy script takes up the entire back side of the letter. Onto the bottom she rubber-stamped a zebra, her favorite animal. Beth talked constantly, an animated monologue with long tangents. “But, I digress,” she’d say, then circle back to her original point. The birthday card represents a Beth monologue in miniature, a verbal declaration recorded on paper. Ok, she began, here’s the thing. She went on to tell me that she’d planned to give me a birthday present even though I told her I didn’t want one. The card was a story of her attempt to get me the gift. She alluded to an argument with a city bus driver, among other obstacles she faced. Finally, near the bottom of the page, she explained the present: a gift certificate to Twice Sold Tales, a used bookstore near our office. Only the store didn’t sell gift certificates, so she wanted to take me book shopping. She concluded the letter, It’ll be more fun together anyway. I don’t know which title I chose, but I remember the trip to the bookstore. After work, we drove the half-mile to the commercial district of the Fremont neighborhood. We parked by the Baptist church and walked down the hill. It was April, early evening, warm enough for Twice Sold Tales’ door to be propped open. Jazz from speakers in the adjacent vinyl record shop filtered into the bookstore. The lone employee, a man our age, mumbled hello when we stepped inside. Incense burned in a glass vase next to the register, covering whatever musty smell emanated from the books. I took my time. Upstairs, downstairs, back up again. Beth and I were the only customers in the store. We scanned the shelves separately, then together, searching for the perfect book. The narrow room and sloped ceilings made the upstairs feel like an attic. It grew dark as we shopped, and the employee walked to the corners of each room, flicking on lamps. Did I choose a novel? Short stories? Classic? Contemporary? I don’t recall. I only remember the creak of the stairs as we climbed to the attic. Kneeling next to Beth on the dingy carpet, peering at the shelves like we were much younger versions of ourselves digging in grandmother’s trunk. Standing at the register next to Beth as she handed money to the man, then the book to me. “Happy Birthday,” she said, putting her arm around my shoulder. We wedged ourselves through the doorway arm in arm, and climbed the hill to Beth’s car in the dark. Step 1: go for your free consultation with a personal trainer at your gym. Choose to meet with Paige. Paige is awesome, will clearly become a champion of yours even though she’s not the rah-rah type. Don’t exchange high-fives with Paige after a difficult set. That’s not her thing, and it’s certainly not yours. Instead, sign up for more sessions. Paige will get you hooked on strength training. Paige will tailor your workouts so they don’t aggravate your injured foot. Paige will show you that, despite your 3 abdominal surgeries and your colostomy, you can make your core strong again. She will teach you the word proprioception, your body’s sense of its position and movement in space. In her patient, gentle way will tell you yours is poor. You can still learn the moves, though, despite this flaw. Another obstacle overcome. Step 2: learn of a new surgical technique that might help your foot. Fork over more money. Undergo the procedure, which involves sucking the badness out of your heel: calcified bone, damaged tendon. Keep going to the gym with the boot on your foot. Feel badass. Step 3: Receive a letter from your ostomy nurse, Laura, another champion. A group of people with ostomies are getting together to do a triathlon in August. Team Ostomy United. Would you like to join? Even though your doctor told you you could start running again, you’re not ready yet. But you can walk. There’s a sprint-distance option. 5 kilometers. You can walk that. Visit Ostomy United’s Facebook page. Learn another new word: tri-ostolete. Think: that’s me. 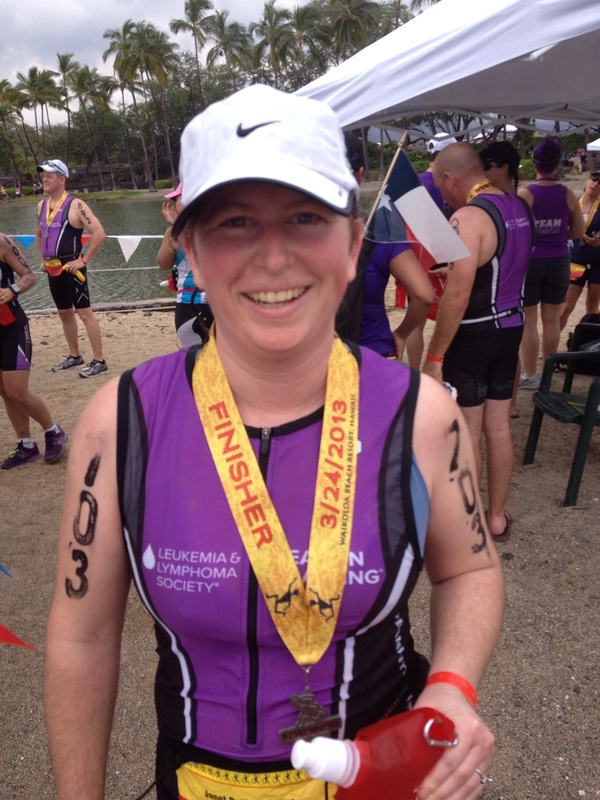 Read stories of cancer survivors who just signed up for their first endurance race. Cry. Register. Step 4: Tell Paige about your race plans. In response, Paige declares on the spot that she will sign up too. Even though she’s a runner, a trainer, a badass, she’ll walk the run course with you. It will be her first triathlon. Argue about who will be slower, who will have to wait for whom. Up your exercise routine. You’ve got a race to train for again. Finally.